So, you know how sometimes you see another scientist’s work and you get ‘system envy’? How you suddenly realize that everything about their system is amazing, and you want to switch to work in their system right now? Well, today I’m going to introduce you guys to a really, really cool system, and then I’m going to do a mini-series of posts about some of the recent work that I’ve seen regarding this system. OK, READY? There aren’t many relevant videos on the internet, but I want you to click this link to go see some really cool worms on youtube. And if you want to see an even more amazing video, you can click here to download it. (It is seriously worth it.) And for pictures, check these out. You’re looking at branchiobdellidans. They’re annelid worms that live as ectosymbionts on crayfish. There are 150 species and 21 genera of branchiobdellidans in the world, and they are all thought to be obligate crayfish symbionts, meaning that they can’t survive and reproduce if they aren’t on a crayfish host. Some of the worm species will hang out anywhere on the crayfish body, while others specialize on the crayfish gill chamber or the crayfish chelae. Are branchiobdellids mutualists, like passengers who pay for their voyage? Are they commensalists, which get a free-ride but don’t harm their hosts, like stowaways? 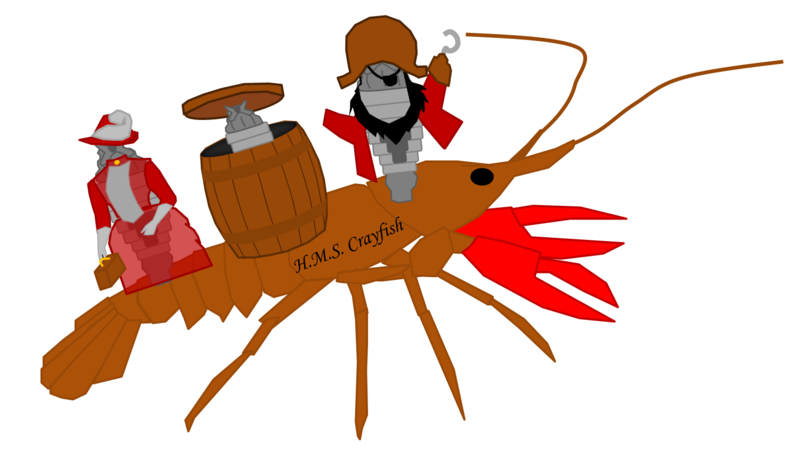 Or are they pirates, which board the crayfish ship by force and loot the crayfish booty? And perhaps more importantly, are there support groups for people obsessed with dressing worms up in fancy costumes? Historically, scientists thought that branchiobdellidans were parasites or commensalists, because they are known to consume crayfish gill tissue. In fact, the more branchiobdellidans a crayfish has, the more scars the crayfish has in the gill tissue. So, that’s sounds rather parasite-ish! But the branchiobdellids also clean the gill chamber, which is good for crayfish respiration. And so the question is whether branchiobdellidans have a net positive or net negative effect on crayfish. Next time, I’ll tell you about a paper that shows that the net effect of branchiobdellidans on crayfish depends on branchiobdellid density and ‘context’, where branchiobdellidans are more beneficial to crayfish when crayfish are in environments where their gills are more likely to be colonized by bacteria and other organisms. Until then, check out this review about branchiobdellidans that just came out in Freshwater Science! Skelton, J., K.J. Farrell, R.P. Creed, B.W. Williams, C. Ames, B.S. Helms, J. Stoekel, and B.L. Brown. 2013. Servants, scoundrels, and hitchhikers: current understanding of the complex interactions between crayfish and their ectosymbiotic worms (Branchiobdellida). Freshwater Science 32(4): 1345-1357. This entry was posted in Cool Literature and tagged annelid, Branchiobdellida, branchiodellidans, commensalism, crayfish, mutualism, symbiosis, worm by dinoverm. Bookmark the permalink.